I'm using version 3.5.7, when I load a ".sup" file to create the srt file via OCR, I get this message. This does not happen with the previous version 3.5.6, how can you solve? 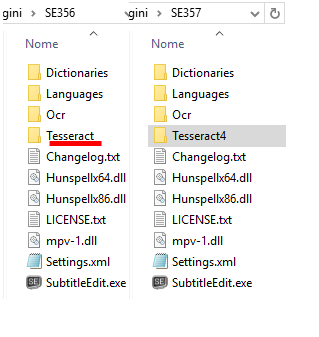 I noticed that in the installation folder, there is a new folder "Tesseract4" instead of "Tesseract", present in the previous version. Last edited by DMD; 24th September 2018 at 14:05. The last beta linked seems to behave like 3.5.6 with tesseract 3.02. Engine mode> Default, based on what is available, it works regularly. If I select Original Tesseract only (can detect italic) I get the error message. Last edited by DMD; 24th September 2018 at 18:10. In the MPC-BE thread an mp4 sample was posted. SubtitleEdit (latest beta) handles it differently than ffmpeg and I think ffmpeg is correct. I'm not 100% sure the file isn't broken but maybe you want to take a look at it. I vaguely remember that there is something odd with ffmpeg and timed text in mp4: The last subtitle would continue until the end of the file. So I would not count (or even bet) on ffmpeg being correct. But I was too lazy to open an issue for it. But this problem is not specifically about the last line. Yes, that seems to be it. I have already encountered files (which have been created by ffmpeg according to their metadata) whose last line continued for several minutes and for which ffmpeg and SubtitleEdit differed in their timings just like in your screenshots. Therefore they might be related somehow. It seems a few old bugs have sneaked in again in version 3.5.7. The "Dialogue one hyphen only" plugin also removed the hyphen in a single line subtitle. Also I encountered several times (not always, though) that, after running "Tools --> Fix common errors", the changes previously made by the "Dialogue one hyphen only" plugin are undone. So I would have to run the plugin again. In version 3.5.6 I didn't run into these issues. I ask if it is possible to enable the font color panel to the hexadecimal code. The possibility is to copy a color with photoshop in hexadecimal code and the possibility to insert it in the appropriate box. What I currently do not allow, but only RGB values. Both version 3.5.6 and 3.5.7 wont auto translate with Google Translate. The lastest beta can only translate about 37 lines with Google Translate but without API Key. And the Microsoft Translator wont working at all without API Key. I have tried to get a free API Key to both Google Translate and Microsoft Translator, but it seems to hard for me. @DMD: Where is this font dialog? How many lines do you get now? I getting a full subtitle now. Edit: The subtitle have 2099 lines. Last edited by Zetti; 4th December 2018 at 21:11. Thanks to the developer for this excellent program. to set in pixels the space/distance between characters? Preferably, under the "Line height" option. It is a really needed option when setting the look of the subtitles, especially when viewing them on TV. @orion44: The default libraries with c#/winforms don't have any 'character spacing' options as far as I know... anybody got any ideas? Also, SE 3.5.8 is out - Now again includes Tesseract 3.02 per default and an in-program option to download the new Tesseract 4 (Tesseract 4 is pretty slow and do not have italic detection - but it has more languages + works better for small difficult fonts). Thank you for the great program. I used it for many BluRays and it worked like a charm. Ich will nur mit dir reden. Is this a bug on the BluRay? But the output has 38564 lines. Would be kind of sisyphean challenge. I had to write a script.